Keeping indoor air environments maintained at a relative humidity level of 40-60% RH prevents these expensive and unsafe electronic component failures. This leads to a wide range of benefits, including increased uptime of avionics and electronics systems, maximized available training time, improved personnel training levels and readiness, heightened OPTEMPO and additional missions completed. Maintaining an indoor environment between 40-60% RH is ideal for electrostatic paint and powder coating in order to create an even, durable coat. Coating in these ideal conditions delivers improved first pass coating results, reduced paint waste and rework, higher equipment readiness rates, increased up time, as well as higher operational readiness and mission accomplishments. Ammunition, gun powder, explosives and any combustible materials being handled have a high risk of danger if there is any spark of static discharge is present. Proper humidification levels significantly reduce chances of static discharge. This leads to reduced explosion hazards, safer working environments, increased material readiness and usage rates, maximized training time, higher operational readiness posture and mission accomplishment rates. Maintaining proper humidity levels of 50-60% RH in ammunition storage areas provides maximized safe shelf life, improved ammunition utilization rates, higher weapons systems qualification rates, and increased mission readiness posture across all departments. 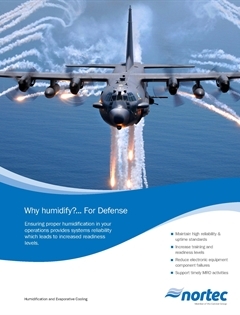 Download our Why Humidify... For Defense Brochure Now!